For Alec Ellens, it was a way to give back for the care he received at Niagara Health. Five years ago, Alec started the Music Appreciation and Meditation Group for patients in the Mental Health program at Niagara Health’s St. Catharines Site. A year prior, Alec had been a patient himself, receiving care and treatment for depression and anxiety in an inpatient unit. Alec eventually returned home and participated in many of the Mental Health Outpatient programs at the hospital, including one with Donna Hollands-Hurst, a member of Niagara Health’s Spiritual Care team. Donna knew Alec had a background in music, and that he wanted to pass on his knowledge to others as part of his recovery goals. Donna encouraged Alec to start the music group, something the Mental Health program didn’t previously offer. Alec, whose musical background includes nearly 30 years as a church organist, worked with Donna and Mental Health Recreation Therapist Kristen Young to develop the Music Appreciation and Meditation Group. "My goal was to help myself and to help patients," Alec says. "You can get anybody to smile. If you can smile, you can sing." The group allows patients to discover the natural, therapeutic power of music and understand the role it plays in our everyday lives. Some of the materials used for the group include a crystalline glass bowl for bowl singing and meditation, plastic pails as drums and tambourines. Alec also taught the group vowel singing, breathing and meditation techniques and discussed topics such as sound imagery and music imagery and colour. Some patients have even brought in other musical instruments, resulting in unexpected jam sessions. After 525 hours of volunteering, Alec recently decided to retire from leading the group sessions. That will now be in the hands of Kristen and others. "It's going to be big shoes to fill," Kristen says. "Alec’s knowledge base of music is really amazing." Kristen says Alec gave hope to other patients that recovery is possible and "that you can lead a normal life and you can use some of the strengths and the passions that you have to give back to your community or to teach others. People look forward to the music group and being able to express themselves and share some of their music stories." Kristen described Alec as a "huge support." "We are very grateful for Alec and his passion for music and meditation, and his dedication as a volunteer," she says. "He has enriched our programming and also the experience of our patients through his love for music. We wish him all the best as he retires from volunteering in this program, and are so grateful for the time we shared with him." 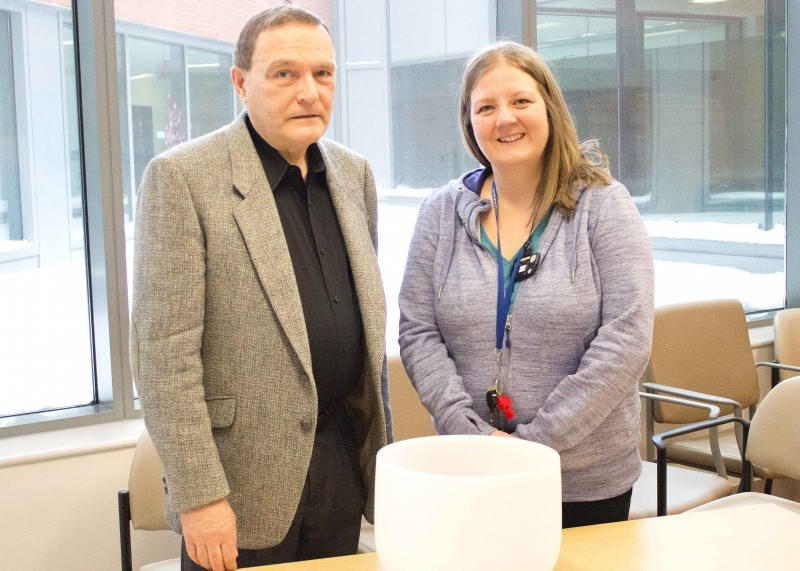 Photo caption: Alec Ellens and Recreation Therapist Kristen Young shown with a singing bowl used in the Music Appreciation and Meditation Group.